If you haven't had the word "hygge" hooted gently at you this year, you won't know about the current craze for the snuggly way of life, Danish-style. Pronounced "hoo-gah", the term translates approximately to enjoying a cosy time: be it snuggled in soft knitwear, taking a candlelit bath or enjoying a sofa-side chat with a loved one, glass of red wine in hand. The concept is nothing new to the Danes but this year, the rest of the world is hitting hygge hard; there are over 1.5 million #hygge on Instagram, while entire stands brimming with books on the notion are spilling out of Foyles. As mystifying as the trend's arrival may be, what is clear is our cue to shop some deliciously comforting clothing in Scandi shades of oatmeal, greige and mink. Well, it's hard to resist the urge to bed down for the oncoming—and sometimes endless-seeming— winter months. 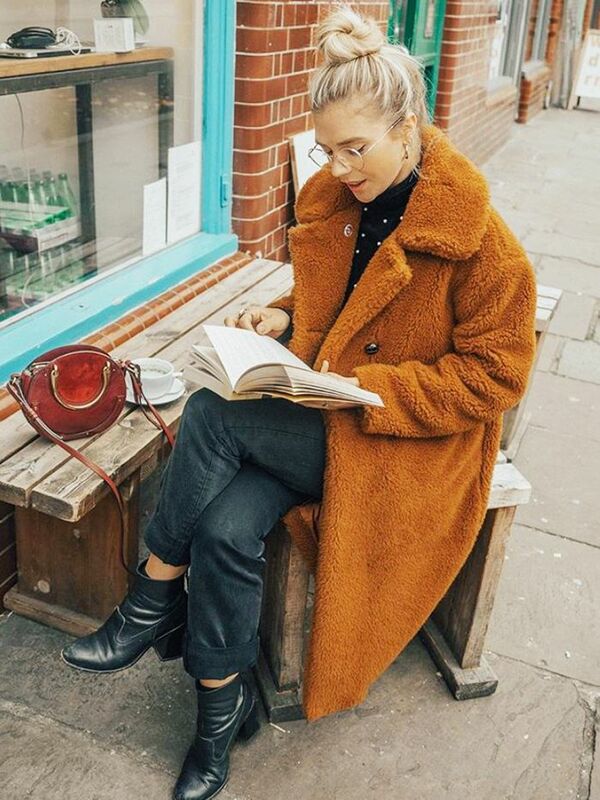 Style inspiration comes by the way of Scandi-chic Danish blogger Isabella Thordsen. Her penchant for fluffy knits, loose cotton tees and minimalistic jewellery make a perfect example of elevated indoor dressing. To get the look, jersey or knitted track pants are simple and affordable essentials, though the Allude cashmere iteration, new to Net-a-Porter, makes for a über indulgent way to wear this trend. Next stop: a slouchy sweater. Be it a well-worn cotton sweatshirt, a sumptuously soft mohair iteration or Ugg's cashmere hoodie, there is one major requirement for a hygge jumper: Thou shalt always buy the next size up. Oversizing allows for the key Scandi styling tricks: scrunched up sleeves (though pulled down, too-long sleeves work perfectly too), a louche tuck in at the waist and the excellent overhang that comes courtesy of a dropped shoulder. Think of this look as built on upscaled staples, with brands like The Elder Statesman turning the most ordinary everyday separates into the softest, most covetable basics. But exercise caution: With our guide to getting hygge this season, you may never want to slip out of your sheepskin-lined boots, and venture out into the outside world again. Keep going to shop the most hygge fashion pieces out there. The finish on these snow boots epitomises folk-chic. Upgrade your lie-ins with a fine cashmere hoodie. The ultimate beanie offsets messy bed hair perfectly. High-fashion gets hygge with Balenciaga's shearling scarf. Are they pyjamas? Or are they real clothes? Frankly, who cares when they look this soft? 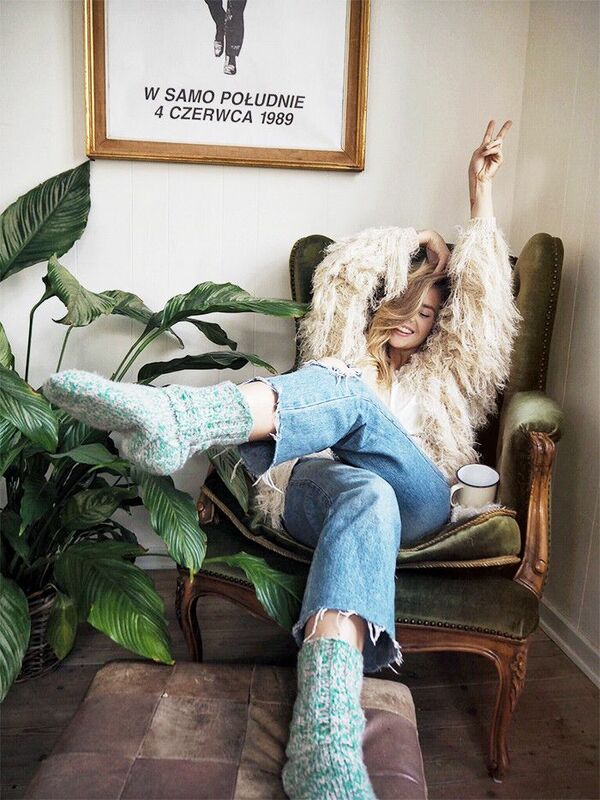 Team your slouchy cashmere socks with an obligatory cosy cuppa. A cable knit in merino wool is a little like taking your duvet outdoors with you. Oatmeal-hue cashmere at its most chill. Part scarf, part blanket—minimalistic geometric patterns take this throw into chic interiors territory. Pastel blue and caramel help channel Scandi chic. These palazzo pants can be as sophisticated or as sloth-y as you like. These tie sleeves are perfect for that too-long, slouchy look, but with a bit of a difference. If you love being warm more than anything else, check out this cosy coat trend that's selling like mad.